For other uses, see Grizzly bear (disambiguation). "Grizzly" redirects here. For other uses, see Grizzly (disambiguation). The grizzly bear (Ursus arctos ssp.) is a large population of the brown bear inhabiting North America. Scientists[who?] generally do not use the name grizzly bear but call it the North American brown bear. Further testing of Y-chromosomes is required to yield an accurate new taxonomy with different subspecies. Coastal grizzlies, often referred to by the popular but geographically redundant synonym of "brown bear" or "Alaskan brown bear" are larger and darker than inland grizzlies, which is why they, too, were considered a different species from grizzlies. Kodiak grizzly bears were also at one time considered distinct. Therefore, at one time there were five different "species" of brown bear, including three in North America. Most adult female grizzlies weigh 130–180 kg (290–400 lb), while adult males weigh on average 180–360 kg (400–790 lb). Average total length in this subspecies is 198 cm (6.50 ft), with an average shoulder height of 102 cm (3.35 ft) and hindfoot length of 28 cm (11 in). Newborn bears may weigh less than 500 grams (1.1 lb). In the Yukon River area, mature female grizzlies can weigh as little as 100 kg (220 lb). One study found that the average weight for an inland male grizzly was around 272 kilograms (600 lb) and the average weight for a coastal male was around 408 kilograms (900 lb). For a female, these average weights would be 136 kilograms (300 lb) inland and 227 kilograms (500 lb) coastal, respectively. On the other hand, an occasional huge male grizzly has been recorded which greatly exceeds ordinary size, with weights reported up to 680 kg (1,500 lb). A large coastal male of this size may stand up to 3 metres (9.8 ft) tall on its hind legs and be up to 1.5 metres (4.9 ft) at the shoulder. Although variable in color from blond to nearly black, grizzly bear fur is typically brown with darker legs and commonly white or blond tipped fur on the flank and back. A pronounced hump appears on their shoulders; the hump is a good way to distinguish a grizzly bear from a black bear, as black bears do not have this hump. Aside from the distinguishing hump a grizzly bear can be identified by a "dished in" profile of their face with short, rounded ears, whereas a black bear has a straight face profile and longer ears. A grizzly bear can also be identified by its rump, which is lower than its shoulders, while a black bear's rump is higher. 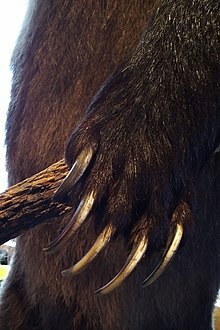 A grizzly bear's front claws measure about 2–4 inches in length and a black bear's measure about 1–2 inches in length. Grizzly bear in Katmai National Park with partially eaten salmon – the heads, skin and subcutaneous tissue are eaten to obtain the most fat. Brown bears are found in Asia, Europe, and North America, giving them the widest ranges of bear species. They also inhabited North Africa and the Middle East. In North America, grizzly bears previously ranged from Alaska down to Mexico and as far east as the western shores of Hudson Bay; the species is now found in Alaska, south through much of western Canada, and into portions of the northwestern United States (including Idaho, Montana, Washington, and Wyoming), extending as far south as Yellowstone and Grand Teton National Parks. It is most commonly found in Canada. In Canada, there are approximately 25,000 grizzly bears occupying British Columbia, Alberta, the Yukon, the Northwest Territories, Nunavut, and the northern part of Manitoba. An article published in 1954 suggested they may be present in the tundra areas of the Ungava Peninsula and the northern tip of Labrador-Quebec. In British Columbia, grizzly bears inhabit approximately 90% of their original territory. There were approximately 25,000 grizzly bears in British Columbia when the European settlers arrived. However, population size has since significantly decreased due to hunting and habitat loss. In 2003, researchers from the University of Alberta spotted a grizzly on Melville Island in the high Arctic, which is the most northerly sighting ever documented. In 2008, it was estimated there were 16,014 grizzly bears. Population estimates for British Columbia are based on hair-snagging, DNA-based inventories, mark-and-recapture, and a refined multiple regression model. A revised Grizzly bear count in 2012 for British Columbia was 15,075. The Alaskan population of 30,000 individuals is the highest population of any province/state in North America. Populations in Alaska are densest along the coast, where food supplies such as salmon are more abundant. The Admiralty Island National Monument protects the densest population—1,600 bears on a 1,600-square mile island. There are currently about 55,000 wild grizzly bears total located throughout North America, most of which reside in Alaska. Only about 1,500 grizzlies are left in the lower 48 states of the US. Of these, about 800 live in Montana. 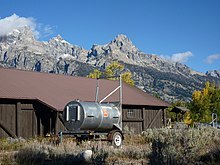 About 600 more live in Wyoming, in the Yellowstone-Teton area. There are an estimated 70–100 grizzly bears living in northern and eastern Idaho. Its original range included much of the Great Plains and the southwestern states, but it has been extirpated in most of those areas. Combining Canada and the United States, grizzly bears inhabit approximately half the area of their historical range. Although the once-abundant grizzly bear (see California grizzly bear) appears prominently on the state flag of California and was the symbol of the Bear Flag Republic before California's admission to the Union, they are no longer naturally present. The last grizzly in all of California was killed in the Sierra foothills east of Fresno in August 1922. In September 2007, a hunter produced evidence of one bear in the Selway-Bitterroot Wilderness ecosystem, by killing a male grizzly bear there. In the North Cascades ecosystem of northern Washington, grizzly bear populations are estimated to be fewer than 20 bears. One sighting of a grizzly bear in 2010 has been recorded. There has been no confirmed sighting of a grizzly in Colorado since 1979. Other provinces and the United States may use a combination of methods for population estimates. Therefore, it is difficult to say precisely what methods were used to produce total population estimates for Canada and North America, as they were likely developed from a variety of studies. The grizzly bear currently has legal protection in Mexico, European countries, some areas of Canada and in the United States. However, it is expected that repopulating its former range will be a slow process, due to a variety of reasons including the bear's slow reproductive habits and the effects of reintroducing such a large animal to areas prized for agriculture and livestock. Competition with other predators and predation on cubs are other possible limiting factors for grizzly bear recovery, though grizzly bears also benefit from scavenged carcasses from predators as an easy food source when other food sources decline. Grizzly bears hibernate for 5–7 months each year except where the climate is warm, as the California grizzly did not hibernate. During this time, female grizzly bears give birth to their offspring, who then consume milk from their mother and gain strength for the remainder of the hibernation period. To prepare for hibernation, grizzlies must prepare a den, and consume an immense amount of food as they do not eat during hibernation. Grizzly bears do not defecate or urinate throughout the entire hibernation period. The male grizzly bear's hibernation ends in early to mid-March, while females emerge in April or early May. In preparation for winter, bears can gain approximately 180 kg (400 lb), during a period of hyperphagia, before going into hibernation. The bear often waits for a substantial snowstorm before it enters its den: such behavior lessens the chances predators will find the den. The dens are typically at elevations above 1,800 m (5,900 ft) on north-facing slopes. There is some debate amongst professionals as to whether grizzly bears technically hibernate: much of this debate revolves around body temperature and the ability of the bears to move around during hibernation on occasion. Grizzly bears can "partially" recycle their body wastes during this period. Although inland or Rocky Mountain grizzlies spend nearly half of their life in dens, coastal grizzlies with better access to food sources spend less time in dens. In some areas where food is very plentiful year round, grizzly bears skip hibernation altogether. Except for females with cubs, grizzlies are normally solitary, active animals, but in coastal areas, grizzlies gather around streams, lakes, rivers, and ponds during the salmon spawn. Every other year, females (sows) produce one to four young (usually two) that are small and weigh only about 450 grams (1 lb) at birth. A sow is protective of her offspring and will attack if she thinks she or her cubs are threatened. Grizzly bears have one of the lowest reproductive rates of all terrestrial mammals in North America. This is due to numerous ecological factors. Grizzly bears do not reach sexual maturity until they are at least five years old. Once mated with a male in the summer, the female delays embryo implantation until hibernation, during which miscarriage can occur if the female does not receive the proper nutrients and caloric intake. On average, females produce two cubs in a litter and the mother cares for the cubs for up to two years, during which the mother will not mate. Once the young leave or are killed, females may not produce another litter for three or more years, depending on environmental conditions. Male grizzly bears have large territories, up to 4,000 km2 (1,500 sq mi), making finding a female scent difficult in such low population densities. Population fragmentation of grizzlies may destabilize the population from inbreeding depression. The gestation period for grizzly bears is approximately 180–250 days. Litter size is between one and four cubs, averaging twins or triplets. Cubs are always born in the mother's winter den while she is in hibernation. Female grizzlies are fiercely protective of their cubs, being able to fend off predators as large as male bears bigger than they are in defence of the cubs. Cubs feed entirely on their mother's milk until summer comes, after which they still drink milk but begin to eat solid foods. Cubs gain weight rapidly during their time with the mother—their weight will have increased from 4.5 to 45 kg (10 to 99 lb) in the two years spent with the mother. Mothers may see their cubs in later years but both avoid each other. The average lifespan for a male is estimated at 22 years, with that of a female being slightly longer at 26. Females live longer than males due to their less dangerous life; they do not engage in seasonal breeding fights as males do. The oldest wild inland grizzly was 34 years old in Alaska; the oldest coastal bear was 39, but most grizzlies die in their first few years of life from predation or hunting. Captive grizzlies have lived as long as 44 years. Canadian or Alaskan grizzlies are larger than those that reside in the American Rocky Mountains. This is due, in part, to the richness of their diets. In Yellowstone National Park in the United States, the grizzly bear's diet consists mostly of whitebark pine nuts, tubers, grasses, various rodents, army cutworm moths, and scavenged carcasses. None of these, however, match the fat content of the salmon available in Alaska and British Columbia. With the high fat content of salmon, it is not uncommon to encounter grizzlies in Alaska weighing 540 kg (1,200 lb). Grizzlies in Alaska supplement their diet of salmon and clams with sedge grass and berries. In areas where salmon are forced to leap waterfalls, grizzlies gather at the base of the falls to feed on and catch the fish. Salmon are at a disadvantage when they leap waterfalls because they cluster together at their bases and are therefore easier targets for the grizzlies. Grizzly bears are well-documented catching leaping salmon in their mouths at Brooks Falls in Katmai National Park and Preserve in Alaska. They are also very experienced in chasing the fish around and pinning them with their claws. At such sites such as Brooks Falls and McNeil Falls in Alaska, big male grizzlies fight regularly for the best fishing spots. Grizzly bears along the coast also forage for razor clams, and frequently dig into the sand to seek them. During the spring and fall, directly before and after the salmon runs, berries and grass make up the mainstay of the diets of coastal grizzlies. Inland grizzlies may eat fish too, most notably in Yellowstone grizzlies eating Yellowstone cutthroat trout. The relationship with cutthroat trout and grizzlies is unique because it is the only example where Rocky Mountain grizzlies feed on spawning salmonid fish. However, grizzly bears themselves and invasive lake trout threaten the survival of the trout population and there is a slight chance that the trout will be eliminated. Meat, as already described, is an important part of a grizzly's diet. Grizzly bears occasionally prey on small mammals, such as marmots, ground squirrels, lemmings, and voles. The most famous example of such predation is in Denali National Park and Preserve, where grizzlies chase, pounce on, and dig up Arctic ground squirrels to eat. In some areas, grizzly bears prey on hoary marmots, overturning rocks to reach them, and in some cases preying on them when they are in hibernation. Larger prey includes bison and moose, which are sometimes taken by bears in Yellowstone National Park. Because bison and moose are dangerous prey, grizzlies usually use cover to stalk them and/or pick off weak individuals or calves. Grizzlies in Alaska also regularly prey on moose calves, which in Denali National Park may be their main source of meat. In fact, grizzly bears are such important predators of moose and elk calves in Alaska and in Yellowstone, that they may kill as many as 51 percent of elk or moose calves born that year. Grizzly bears have also been blamed in the decline of elk in Yellowstone National Park when the actual predators were thought to be gray wolves. In northern Alaska, grizzlies are a significant predator of caribou, mostly taking sick or old individuals or calves. Several studies show that grizzly bears may follow the caribou herds year-round in order to maintain their food supply. In northern Alaska, grizzly bears often encounter muskox. Despite the fact that muskox do not usually occur in grizzly habitat and that they are bigger and more powerful than caribou, predation on muskox by grizzlies has been recorded. Grizzly bears along the Alaskan coast also scavenge on dead or washed up whales. Usually such incidents involve only one or two grizzlies at a carcass, but up to ten large males have been seen at a time eating a dead humpback whale. Dead seals and sea lions are also consumed. Although the diets of grizzly bears vary extensively based on seasonal and regional changes, plants make up a large portion of them, with some estimates as high as 80–90%. Various berries constitute an important food source when they are available. These can include blueberries, blackberries (Rubus fruticosus), salmon berries (Rubus spectabilis), cranberries (Vaccinium oxycoccos), buffalo berries (Shepherdia argentea), soapberries (Shepherdia canadensis), and huckleberries (Vaccinium parvifolium), depending on the environment. Insects such as ladybugs, ants, and bees are eaten if they are available in large quantities. In Yellowstone National Park, grizzly bears may obtain half of their yearly caloric needs by feeding on miller moths that congregate on mountain slopes. When food is abundant, grizzly bears will feed in groups. For example, many grizzly bears will visit meadows right after an avalanche or glacier slide. This is due to an influx of legumes, such as Hedysarum, which the grizzlies consume in massive amounts. When food sources become scarcer, however, they separate once again. The removal of wolves and the grizzly bear in California may have greatly reduced the abundance of the endangered San Joaquin Kit Fox. With the reintroduction of gray wolves to Yellowstone, many visitors have witnessed a once common struggle between a keystone species, the grizzly bear, and its historic rival, the gray wolf. The interactions of grizzly bears with the wolves of Yellowstone have been under considerable study. Typically, the conflict will be in the defence of young or over a carcass, which is commonly an elk killed by wolves. The grizzly bear uses its keen sense of smell to locate the kill. As the wolves and grizzly compete for the kill, one wolf may try to distract the bear while the others feed. The bear then may retaliate by chasing the wolves. If the wolves become aggressive with the bear, it is normally in the form of quick nips at its hind legs. Thus, the bear will sit down and use its ability to protect itself in a full circle. Rarely do interactions such as these end in death or serious injury to either animal. One carcass simply is not usually worth the risk to the wolves (if the bear has the upper hand due to strength and size) or to the bear (if the wolves are too numerous or persistent). While wolves usually dominate grizzly bears during interactions at wolf dens, both grizzly and black bears have been reported killing wolves and their cubs at wolf dens even when the latter was in defence mode. Black bears generally stay out of grizzly territory, but grizzlies may occasionally enter black bear terrain to obtain food sources both bears enjoy, such as pine nuts, acorns, mushrooms, and berries. When a black bear sees a grizzly coming, it either turns tail and runs or climbs a tree. Black bears are not strong competition for prey because they have a more herbivorous diet. Confrontations are rare because of the differences in size, habitats, and diets of the bear species. When this happens, it is usually with the grizzly being the aggressor. The black bear will only fight when it is a smaller grizzly such as a yearling or when the black bear has no other choice but to defend itself. There is at least one confirmed observation of a grizzly bear digging out, killing and eating a black bear when the latter was in hibernation. The segregation of black bear and grizzly bear populations is possibly due to competitive exclusion. In certain areas, grizzly bears outcompete black bears for the same resources. For example, many Pacific coastal islands off British Columbia and Alaska support either the black bear or the grizzly, but rarely both. In regions where both species coexist, they are divided by landscape gradients such as age of forest, elevation and openness of land. Grizzly bears tend to favor old forests with high productivity, higher elevations and more open habitats compared with black bears. The relationship between grizzly bears and other predators is mostly one-sided; grizzly bears will approach feeding predators to steal their kill. In general, the other species will leave the carcasses for the bear to avoid competition or predation. Any parts of the carcass left uneaten are scavenged by smaller animals. Cougars generally give the bears a wide berth. Grizzlies have less competition with cougars than with other predators, such as coyotes, wolves, and other bears. When a grizzly descends on a cougar feeding on its kill, the cougar usually gives way to the bear. When a cougar does stand its ground, it will use its superior agility and its claws to harass the bear, yet stay out of its reach until one of them gives up. Grizzly bears occasionally kill cougars in disputes over kills. There have been several accounts, primarily from the late 19th and early 20th centuries, of cougars and grizzly bears killing each other in fights to the death. The other big cat that is present in the United States, which may pose as a threat to bears, is the jaguar. Coyotes, foxes, and wolverines are generally regarded as pests to the grizzlies rather than competition, though they may compete for smaller prey, such as ground squirrels and rabbits. All three will try to scavenge whatever they can from the bears. Wolverines are aggressive enough to occasionally persist until the bear finishes eating, leaving more scraps than normal for the smaller animal. Packs of coyotes have also displaced grizzly bears in disputes over kills. The grizzly bear has several relationships with its ecosystem. One such relationship is a mutualistic relationship with fleshy-fruit bearing plants. After the grizzly consumes the fruit, the seeds are excreted and thereby dispersed in a germinable condition. Some studies have shown germination success is indeed increased as a result of seeds being deposited along with nutrients in feces. This makes grizzly bears important seed distributors in their habitats. While foraging for tree roots, plant bulbs, or ground squirrels, bears stir up the soil. This process not only helps grizzlies access their food, but also increases species richness in alpine ecosystems. An area that contains both bear digs and undisturbed land has greater plant diversity than an area that contains just undisturbed land. Along with increasing species richness, soil disturbance causes nitrogen to be dug up from lower soil layers, and makes nitrogen more readily available in the environment. An area that has been dug by the grizzly bear has significantly more nitrogen than an undisturbed area. Nitrogen cycling is not only facilitated by grizzlies digging for food, it is also accomplished via their habit of carrying salmon carcasses into surrounding forests. It has been found that spruce tree (Picea glauca) foliage within 500 m (1,600 ft) of the stream where the salmon have been obtained contains nitrogen originating from salmon on which the bears preyed. These nitrogen influxes to the forest are directly related to the presence of grizzly bears and salmon. Grizzlies directly regulate prey populations and also help prevent overgrazing in forests by controlling the populations of other species in the food chain. An experiment in Grand Teton National Park in Wyoming in the United States showed removal of wolves and grizzly bears caused populations of their herbivorous prey to increase. This, in turn, changed the structure and density of plants in the area, which decreased the population sizes of migratory birds. This provides evidence grizzly bears represent a keystone predator, having a major influence on the entire ecosystem they inhabit. When grizzly bears fish for salmon along the coasts of Alaska and British Columbia, they often only eat the skin, brain and roe of the fish. In doing so, they provide a food source for gulls, ravens, and foxes, all of which eat salmon as well; this benefits both the bear and the smaller predators. 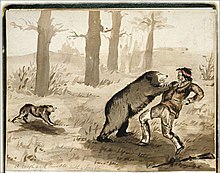 Native Americans fighting a Grizzly Bear, 1844 painting by George Catlin. Grizzlies are considered more aggressive compared to black bears when defending themselves and their offspring. Unlike the smaller black bears, adult grizzlies do not climb trees well and respond to danger by standing their ground and warding off their attackers. Mothers defending cubs are the most prone to attacking, and are responsible for 70% of humans killed by grizzlies. Grizzly bears normally avoid contact with people. In spite of their obvious physical advantage they rarely actively hunt humans. Most grizzly bear attacks result from a bear that has been surprised at very close range, especially if it has a supply of food to protect, or female grizzlies protecting their offspring. A bear killing a human in a national park may be killed to prevent its attacking again. Exacerbating this is the fact that intensive human use of grizzly habitat coincides with the seasonal movement of grizzly bears. Increased human–bear interaction has created "problem bears": bears adapted to human activities or habitat. Aversive conditioning using rubber bullets, foul-tasting chemicals, or acoustic deterrent devices attempt to condition bears to associate humans with unpleasantness, but is ineffectual when bears have already learned to positively associate humans with food. Such bears are translocated or killed because they pose a threat to humans. The B.C. government kills approximately 50 problem bears each year and overall spends more than one million dollars annually to address bear complaints, relocate bears and kill them. Bear awareness programs have been developed by numerous towns in British Columbia, Canada, to help prevent conflicts with both black and grizzly bears. The main premise of these programs is to teach humans to manage foods that attract bears. Keeping garbage securely stored, harvesting fruit when ripe, securing livestock behind electric fences, and storing pet food indoors are all measures promoted by bear awareness programs. The fact that grizzly bears are less numerous and even protected in some areas, means that preventing conflict with grizzlies is especially important. Revelstoke, British Columbia is a community that demonstrates the success of this approach. In the ten years preceding the development of a community education program in Revelstoke, 16 grizzlies were destroyed and a further 107 were relocated away from the town. An education program run by Revelstoke Bear Aware was put in place in 1996. Since the program began just four grizzlies have been eliminated and five have been relocated. For back-country campers, hanging food between trees at a height unreachable to bears is a common procedure, although some grizzlies can climb and reach hanging food in other ways. An alternative to hanging food is to use a bear canister. Traveling in groups of six or more can significantly reduce the chance of bear-related injuries while hiking in bear country. Grizzly bears are especially dangerous because of the force of their bite, which has been measured at over 8 megapascals (1160 psi). It has been estimated that a bite from a grizzly could even crush a bowling ball. The grizzly bear is listed as threatened in the contiguous United States and endangered in parts of Canada. In May 2002, the Canadian Species at Risk Act listed the Prairie population (Alberta, Saskatchewan and Manitoba range) of grizzly bears as extirpated in Canada. As of 2002, grizzly bears were listed as special concern under the COSEWIC registry and considered threatened under the U.S. Fish and Wildlife Service. Within the United States, the U.S. Fish and Wildlife Service concentrates its effort to restore grizzly bears in six recovery areas. These are Northern Continental Divide (Montana), Yellowstone (Montana, Wyoming, and Idaho), Cabinet-Yaak (Montana and Idaho), Selway-Bitterroot (Montana and Idaho), Selkirk (Idaho and Washington), and North Cascades (Washington). The grizzly population in these areas is estimated at 750 in the Northern Continental Divide, 550 in Yellowstone, 40 in the Yaak portion of the Cabinet-Yaak, and 15 in the Cabinet portion (in northwestern Montana), 105 in Selkirk region of Idaho, 10–20 in the North Cascades, and none currently in Selway-Bitterroots, although there have been sightings. These are estimates because bears move in and out of these areas, and it is therefore impossible to conduct a precise count. In the recovery areas that adjoin Canada, bears also move back and forth across the international boundary. The U.S. Fish and Wildlife Service claims the Cabinet-Yaak and Selkirk areas are linked through British Columbia, a claim that is disputed. U.S. and Canadian national parks, such as Banff National Park, Yellowstone and Grand Teton, and Theodore Roosevelt National Park are subject to laws and regulations designed to protect the bears. A sign at a BC Park warns campers to hang food, garbage, and toiletries out of reach of bears, or to use a secure bear cache. On 9 January 2006, the US Fish and Wildlife Service proposed to remove Yellowstone grizzlies from the list of threatened and protected species. In March 2007, the U.S. Fish and Wildlife Service "de-listed" the population, effectively removing Endangered Species Act protections for grizzlies in the Yellowstone National Park area. Several environmental organizations, including the NRDC, brought a lawsuit against the federal government to relist the grizzly bear. On 22 September 2009, U.S. District Judge Donald W. Molloy reinstated protection due to the decline of whitebark pine tree, whose nuts are an important source of food for the bears. In 1996 the International Union for Conservation of Nature moved the grizzly bear to the lower risk "Least Concern" status on the IUCN Red List. Farther north, in Alberta, Canada, intense DNA hair-snagging studies in 2000 showed the grizzly population to be increasing faster than what it was formerly believed to be, and Alberta Sustainable Resource Development calculated a population of 841 bears. In 2002, the Endangered Species Conservation Committee recommended that the Alberta grizzly bear population be designated as threatened due to recent estimates of grizzly bear mortality rates that indicated the population was in decline. A recovery plan released by the provincial government in March 2008 indicated the grizzly population is lower than previously believed. In 2010, the provincial government formally listed its population of about 700 grizzlies as "Threatened". Environment Canada consider the grizzly bear to a "special concern" species, as it is particularly sensitive to human activities and natural threats. In Alberta and British Columbia, the species is considered to be at risk. In 2008, it was estimated there were 16,014 grizzly bears in the British Columbia population, which was lower than previously estimated due to refinements in the population model. The Mexican grizzly bear (Ursus arctos nelsoni) is extinct. Conservation efforts have become an increasingly vital investment over recent decades, as population numbers have dramatically declined. Establishment of parks and protected areas are one of the main focuses currently being tackled to help reestablish the low grizzly bear population in British Columbia. One example of these efforts is the Khutzeymateen Grizzly Bear Sanctuary located along the north coast of British Columbia; at 44,300 hectares (109,000 acres) in size, it is composed of key habitat for this threatened species. Regulations such as limited public access, as well as a strict no hunting policy, have enabled this location to be a safe haven for local grizzlies in the area. When choosing the location of a park focused on grizzly bear conservation, factors such as habitat quality and connectivity to other habitat patches are considered. The Refuge for Endangered Wildlife located on Grouse Mountain in Vancouver is an example of a different type of conservation effort for the diminishing grizzly bear population. The refuge is a five-acre terrain which has functioned as a home for two orphaned grizzly bears since 2001. The purpose of this refuge is to provide awareness and education to the public about grizzly bears, as well as providing an area for research and observation of this secluded species. Another factor currently being taken into consideration when designing conservation plans for future generations are anthropogenic barriers in the form of urban development and roads. These elements are acting as obstacles, causing fragmentation of the remaining grizzly bear population habitat and prevention of gene flow between subpopulations (for example, Banff National Park). This, in turn, is creating a decline in genetic diversity, and therefore the overall fitness of the general population is lowered. In light of these issues, conservation plans often include migration corridors by way of long strips of "park forest" to connect less developed areas, or by way of tunnels and overpasses over busy roads. Using GPS collar tracking, scientists can study whether or not these efforts are actually making a positive contribution towards resolving the problem. To date, most corridors are found to be infrequently used, and thus genetic isolation is currently occurring, which can result in inbreeding and therefore an increased frequency of deleterious genes through genetic drift. Current data suggest female grizzly bears are disproportionately less likely than males to use these corridors, which can prevent mate access and decrease the number of offspring. In the United States, national efforts have been made since 1982 for the recovery plan of grizzly bears. A lot of the efforts made have been through different organizations efforts to educate the public on grizzly bear safety, habits of grizzly bears and different ways to reduce human-bear conflict. The Interagency Grizzly Bear Recovery Committee is one of many organizations committed to the recovery of grizzly bears in the lower 48 states. There are five recovery zones for grizzly bears in the lower 48 states including the North Cascades ecosystem in Washington state. The National Park Service and U.S. Fish and Wildlife initiated the process of an environmental impact statement that started in the fall of 2014 to begin the recovery process of grizzly bears to the North Cascades region. A final plan and environmental impact statement was released in the spring of 2017 with a record of decision to follow. In early March 2016, the U.S. Fish and Wildlife Service proposed to withdraw Endangered Species Act protections from grizzly bears in and around Yellowstone National Park. The population has risen from 136 bears in 1975 to an estimated 700 in 2017, and was "delisted" in June 2017. In the past 20 years in Alaska, ecotourism has boomed. While many people come to Alaska to bear-hunt, the majority come to watch the bears and observe their habits. Some of the best bear viewing in the world occurs on coastal areas of the Alaska Peninsula, including in Lake Clark National Park and Preserve, Katmai National Park and Preserve, and the McNeil River State Game Sanctuary and Refuge. Here bears gather in large numbers to feast on concentrated food sources, including sedges in the salt marshes, clams in the nearby tidal flats, salmon in the estuary streams, and berries on the neighboring hillsides. Katmai National Park and Preserve is one of the best spots to view brown bears. The bear population in Katmai is estimated at a healthy 2,100. The park is located on the Alaskan Peninsula about 480 km (300 mi) southwest of the city of Anchorage. At Brooks Camp, a famous site exists where grizzlies can be seen catching salmon from atop a platform—you can even view this online from a cam. In coastal areas of the park, such as Hallo Bay, Geographic Harbor, Swikshak Lagoon, American Creek, Big River, Kamishak River, Savonoski River, Moraine Creek, Funnel Creek, Battle Creek, Nantuk Creek, Kukak Bay, and Kaflia Bay you can often watch bears fishing alongside wolves, eagles, and river otters. Coastal areas host the highest population densities year round because there is a larger variety of food sources available, but Brooks Camp hosts the highest population (100 bears). The McNeil River State Game Sanctuary and Refuge, on the McNeil River, is home to the greatest concentration of brown bears in the world. An estimated 144 individual bears have been identified at the falls in a single summer with as many as 74 at one time; 60 or more bears at the falls is a frequent sight, and it is not uncommon to see 100 bears at the falls throughout a single day. The McNeil River State Game Refuge, containing Chenik Lake and a smaller number of grizzly bears, has been closed to grizzly hunting since 1995. All of the Katmai-McNeil area is closed to hunting except for Katmai National Preserve, where regulated legal hunting takes place. In all, the Katmai-McNeil area has an estimated 2,500 grizzly bears. Admiralty Island, in southeast Alaska, was known to early natives as Xootsnoowú, meaning "fortress of bears," and is home to the densest grizzly population in North America. An estimated 1600 grizzlies live on the island, which itself is only 140 km (90 mi) long. One place to view grizzly bears in the island is probably Pack Creek, in the Stan Price State Wildlife Sanctuary. 20 to 30 grizzlies can be observed at the creek at one time and like Brooks Camp, visitors can watch bears from an above platform. Kodiak Island, hence its name, is another place to view bears. An estimated 3,500 Kodiak grizzly bears inhabit the island, 2,300 of these in the Kodiak National Wildlife Refuge. The O'Malley River is considered the best place on Kodiak Island to view grizzly bears. ^ a b c Schwartz, C. C., Miller, S. D. and Haroldson, M. A. (2003). "Grizzly bear" Archived 7 January 2014 at the Wayback Machine. pp. 556–586 in G. A. Feldhamer, B. C. Thompson and J. A. Chapman, eds. 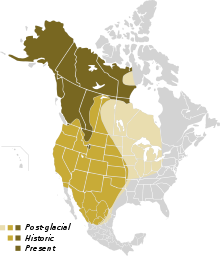 Wild Mammals of North America: Biology, Management, and Conservation. Johns Hopkins University Press, Baltimore, MD. ^ a b c d Storer, T. I.; Tevis, L. P. (27 December 1996). California Grizzly. Berkeley, CA: University of California Press. p. 335. ISBN 978-0520205208. ^ "Homepage" (PDF). Wildpro. Archived from the original (PDF) on 30 September 2011. Retrieved 6 July 2017. ^ Wright, William Henry (1909). 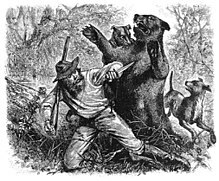 The Grizzly Bear: The Narrative of a Hunter-naturalist, Historical, Scientific and Adventurous. Retrieved 25 January 2016. ^ "Grisly indeed, Grizzly Island was aptly named". Daily Republic. Retrieved 5 May 2011. ^ Cronin, M. A.; Armstrup, S. C.; Garner, and E. R. Vyse, G. W.; Vyse, E.R. (1991). "Interspecific and intraspecific mitochondrial DNA variation in North American bears (Ursus)". Can. J. Zool. 69 (12): 2985–2992. doi:10.1139/z91-421. ^ a b c d e f g h Blood, D. A. (2002). "Grizzly Bears in British Columbia" (PDF). Province of British Columbia: Ministry of Water, Land and Air Protection. ^ Paabo, Svante (15 February 2000). "Of bears, conservation genetics, and the value of time travel". PNAS. 97 (4): 1320–1321. doi:10.1073/pnas.97.4.1320. PMC 34293. PMID 10677456. Retrieved 25 January 2016. ^ Leonard, J.A. ; Wayne, R.K.; Cooper, A. (2000). "Population genetics of ice age brown bears". Proceedings of the National Academy of Sciences. 97 (4): 1651–1654. doi:10.1073/pnas.040453097. PMC 26490. PMID 10677513. ^ Erdbrink, D.P. (1953). A review of the fossil and extinct bears of the old world. ^ Rausch, Robert (1953). "On the status of some arctic animals". Arctic. 6 (2): 91–148. doi:10.14430/arctic3870. ^ Rausch, R.L. (1963). "Geographic variation in size in North American brown bears, Ursus arctos L., as indicated by condylobasal length". Canadian Journal of Zoology. 41: 33–45. doi:10.1139/z63-005. ^ Wood, G. The Guinness Book of Animal Facts and Feats. Sterling Pub Co Inc. (1983), ISBN 978-0-85112-235-9. ^ "Kodiak Bear Fact Sheet". Alaska Department of Fish and Game. Retrieved 27 October 2008. ^ Species Profile: Grizzly bear (Ursus arctos horribilis) Archived 15 October 2011 at the Wayback Machine. U.S. Fish and Wildlife Service. Ecos.fws.gov. Retrieved 17 August 2012. ^ a b c "Western Wildlife Outreach Project: Grizzly Bear Identification". Western Wildlife Outreach Project. Retrieved 15 March 2015. ^ Calvignac, Sebastien; Hughes, Sandrine; Hanni, Catherine (2009). "Genetic diversity of endangered brown bear (Ursus arctos) populations at the crossroads of Europe, Asia and Africa". Diversity and Distributions. 15 (5): 742–750. doi:10.1111/j.1472-4642.2009.00586.x. ^ Elton, C. (1954). "Further evidence about the barren-ground grizzly bear in northeast Labrador and Quebec". Journal of Mammalogy. 35 (3): 345–357. doi:10.2307/1375959. JSTOR 1375959. ^ Harington, C.R. (2008). "The evolution of Arctic marine mammals". Ecological Applications. 18 (2 Suppl): S23–40. doi:10.1890/06-0624.1. PMID 18494361. ^ Doupe, J.P.; England, J.H. ; Furze, M.; Paetkau, D. (2007). "Most Northerly Observation of a Grizzly Bear (Ursus arctos) in Canada: Photographic and DNA Evidence from Melville Island, Northwest Territories". Arctic. 60 (3): 271–276. doi:10.14430/arctic219. ^ Hamilton, A. N. 2008. "Grizzly Bear Population Estimate for British Columbia." Ministry of Environment, British Columbia. ^ Ministry of Forests, Lands; Natural Resource Operations (April 2012). "British Columbia Grizzly Bear Population Estimate for 2012" (PDF). British Columbia Ministry of Environment. Retrieved 26 May 2016. ^ Rogers, Lynn. "Grizzly Attack – Timothy Treadwell". katmaibears.com. ^ "Tongass National Forest – Nature Viewing". Retrieved 26 May 2016. ^ "Grizzly Bear Facts | National Geographic". National Geographic. Archived from the original on 21 March 2013. Retrieved 13 March 2013. ^ "Montanakids | Grizzly Bears". Montanakids. Retrieved 24 August 2014. ^ "With Deadly Attacks Up, Federal Officials Prepare to Remove Grizzly Protections". outsideonline.com. Archived from the original on 5 August 2013. Retrieved 18 April 2013. ^ "California State Library – History and Culture – State Symbols". ^ Welch, Craig (2 July 2011). "Rare grizzly bear photographed in North Cascades". Seattle Times. Retrieved 13 February 2017. ^ "Wildlife Officials Hope Grizzly Bears Stay Out Of Colorado". CBS Denver. 23 May 2012. ^ "Hibernation in grizzly bears". National Wildlife Federation. ^ "Grizzly Bear". Animal Fact Guide. Retrieved 26 September 2013. ^ Hellgren, Eric (1998). "Physiology of hibernation in bears" (PDF). Ursus. 10: 467. ^ ""Hibernation-Migration-Fascination" Narrative". National Park Service. Retrieved 6 July 2013. ^ "Grizzly Bear Information, Photos, and Facts". American Expedition. ^ "Denning and Hibernation Behavior". National Park Service. Retrieved 6 July 2013. ^ Di Jensen, Elle. "When Are Grizzly Bears Awake & When Do They Sleep?". Demand Media. ^ Grizzly Bears, Grizzly Bear Pictures, Grizzly Bear Facts – National Geographic. Animals.nationalgeographic.com. Retrieved 17 August 2012. ^ a b "Trophy Hunting of BC Grizzly Bears". Pacific Wild. Archived from the original on 31 March 2009. ^ a b MacDonald, Jason; MacDonald, Paula; MacPhee, Mitchell & Nicolle, Paige. "Endangered Wildlife: Grizzly Bear". Edu.pe.ca. ^ Herrero, Stephen. "Grizzly Bear". The Canadian Encyclopedia. ^ Assessment and Update Status Report on the Grizzly Bear Ursus arctos in Canada (PDF). Committee on the Status of Endangered Wildlife in Canada. 2002. ISBN 978-0-662-32568-0. ^ "Bear Wars: Rare Photos of a Mamma Grizzly Battling a Huge Male to Protect Her Cub". Field and Stream. 31 March 2011. ^ "THE REINTRODUCTION OF ORPHANED GRIZZLY BEAR CUBS INTO THE WILD" (PDF). Bear Biology. ^ "Brown Bear – Ursus Arctos". National Park Service. Retrieved 29 December 2013. ^ "Grizzly Bear Population Ecology and Monitoring Denali National Park and Preserve" (PDF). National Park Service. ^ Herrero, Stephen (2002). Bear Attacks: Their Causes and Avoidance. Guilford, Conn.: Lyons Press. ISBN 978-1-58574-557-9. ^ "Food For Thought". Shadow of the Bear. Archived from the original on 29 December 2013. ^ "Food Habits of Grizzly Bears and Black Bears in the Yellowstone Ecoystem". National Park Service. Retrieved 6 July 2013. ^ "Brown Bear: facts, diet, habitat, baby cubs, claws, kodiak". Bear Life. ^ "Brown, Grizzly or Kodiak Bear". shadowofthebear.com. ^ "The ultimate teddy bears' picnic as grizzlies congregate for annual salmon catch in US river". London: dailymail.co.uk. 27 July 2011. Retrieved 27 July 2011. 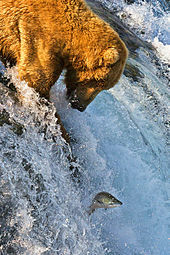 ^ "Image of the Month – Brown bear chasing salmon". Expeditions Alaska. 31 October 2010. ^ "All About Bears – WildCam Grizzlies". National Geographic. Archived from the original on 30 December 2013. ^ "Grizzly Bears Clamming". The Grizzly Bear Blog. ^ "Grizzly Bear – Denali National Park and Preserve". National Park Service. ^ a b "Grizzly Bears & Cutthroat Trout". National Park Service. Retrieved 29 December 2013. ^ Peterson, Christine (14 May 2013). "Grizzlies may be link between drops in cutthroat trout and elk calves". trib.com. ^ "Grizzly bear feeding habits". National Park Service. ^ "Encounters Explorer – Grizzly Bear – Natural History". Wild Explorer. ^ Whitaker, John O. (1980) The Audubon Society Field Guide to North American Mammals. Chanticleer Press, New York, p. 388. ISBN 0-394-50762-2. ^ "Moose Moms Prefer Traffic to Grizzly Bears, Study Says". National Geographic. Retrieved 12 October 2007. ^ Wyman T (2002). "Grizzly bear predation on a bull bison in Yellowstone National Park" (PDF). Ursus. 13: 375. ^ "Predator/Prey Relationships". Alaska Department of Fish and Game. ^ Manning, Elizabeth (25 June 2001). "Study show grizzlies are killing moose calves". Peninsula Clarion. ^ "As calving season gets into full swing, so does the food source for predators". newsminer.com. Retrieved 26 December 2012. ^ "Shiras Moose Demography Project". Wyoming Cooperative Fish and Wildlife Research Unit. ^ "Grizzlies, not wolves, major elk calf predator". forwolves.org. 31 October 2004. ^ Reynolds, Harry V.; Garner, Gerald W.; Reynolds, H. V. (1987). "Patterns of Grizzly Bear Predation on Caribou in Northern Alaska" (PDF). Int. Conf. Bear Res. And Management. 7: 59–67. doi:10.2307/3872608. JSTOR 3872608. ^ "Grizzly bear predation rates on caribou calves in northeastern Alaska". United States Global Service. ^ Boertje, R. D.; Gasaway, W. C.; Grangaard, D. V.; Kelleyhouse, D. G. (1988). "Predation on moose and caribou by radio-collared grizzly bears in east central Alaska". Canadian Journal of Zoology. 66 (11): 2492–2499. doi:10.1139/z88-369. ^ "GRIZZLY BEAR PREDATION ON MUSKOX". Gobies to Grizzlies. 27 July 2008. ^ "MARINE MAMMALS ON THE MENU". Gobies to Grizzlies. Retrieved 16 September 2008. ^ "Grizzly". Hinterland Who's Who. Archived from the original on 3 January 2011. Retrieved 4 March 2010. ^ "Yellowstone Grizzly Bears Eat 40,000 Moths a Day In August". Yellowstone International. 21 June 2011. Retrieved 10 September 2011. ^ Derych, John (2001). "Brown / Grizzly Bear Facts". North American Bear Center. ^ Clark Jr., Howard O. (2007). "Hypothetical Relationships Between The San Joaquin Kit Fox, California Grizzly Bear, and Gray Wolf on the Pre-European California Landscape". Endangered Spec. Update. 24: 14–19. ^ Gunther, K. A. & Smith, D. W. (2004). "Interactions between wolves and female grizzly bears with cubs in Yellowstone National Park". Ursus. 15 (2): 232–238. doi:10.2192/1537-6176(2004)015<0232:IBWAFG>2.0.CO;2. ^ "Yellowstone wolves' return means more grizzly food". Los Angeles Times. 1 August 2013. ^ "How wolves interact with other predators". wolfbehavior. Archived from the original on 28 December 2012. ^ "Potential Interactions Between Bears & Wolves". National Park Service. ^ Busch, Robert H. (2000) The Grizzly Almanac. New York, p. 94. ISBN 1-58574-143-4. ^ a b Apps, C. D.; McLellan, B. N. & Woods, J. G. (2006). "Landscape partitioning and spatial inferences of competition between black and grizzly bears". Ecography. 29 (4): 561–572. doi:10.1111/j.0906-7590.2006.04564.x. ^ Mattson, T.; Herrero, D. J. & Merrill, S. (2005). "Are black bears a factor in the restoration of North American grizzly bear populations?". Ursus. 16: 11–30. doi:10.2192/1537-6176(2005)016[0011:ABBAFI]2.0.CO;2. ^ a b "Wolverine". Montana Outdoors. ^ Hornocker, M., and S. Negri (Eds.). (2009). Cougar: ecology and conservation. University of Chicago Press. Chicago, IL, ISBN 0226353443. ^ Richard Grant (October 2016). "The Return of the Great American Jaguar". Smithsonian Magazine. Retrieved 2 October 2016. ^ "Yellowstone Wildlife – Coyote". yellowstonenationalpark.com. Retrieved 10 May 2011. ^ Meyer, G. & Witmer, M. (1998). "Influence of Seed Processing by Frugivorous Birds on Germination Success of Three North American Shrubs". American Midland Naturalist. 140 (1): 129–139. doi:10.1674/0003-0031(1998)140[0129:IOSPBF]2.0.CO;2. ^ Willson, M. & Gende, S. (2004). "Seed Dispersal by Brown Bears, Ursus arctos, in Southeastern Alaska". Canadian Field-Naturalist. 118 (4): 499–503. ^ a b Doak, D. & Loso, M. (2003). "Effects of Grizzly Bear Digging on Alpine Plant Community Structure" (Submitted manuscript). Arctic, Antarctic, and Alpine Research. 35 (4): 499–503. doi:10.1657/1523-0430(2003)035[0421:EOGBDO]2.0.CO;2. ^ Tardiff, S. & Stanford, J. (1998). "Grizzly Bear Digging: Effects on Subalpine Meadow Plants in Relation to Mineral Nitrogen Availability". Ecology. 79 (7): 2219–2228. doi:10.1890/0012-9658(1998)079[2219:GBDEOS]2.0.CO;2. ^ Rich, T.; Carlson, S.; Gende, S. & Rich, H. (2009). "Transportation of Pacific Salmon Carcasses from Streams to Riparian Forests by Bears". Canadian Journal of Zoology. 87 (3): 195–203. doi:10.1139/Z09-004. ^ Hilderbrand, G.; Hanley, T.; Robbins, C. & Schwartz, C. (1999). "Role of Brown Bears (Ursus arctos) in the Flow of Marine Nitrogen into a Terrestrial Ecosystem". Oecologia. 121 (4): 546–550. doi:10.1007/s004420050961. PMID 28308364. ^ Helfield, J. & Naiman, R. (2006). "Keystone Interactions: Salmon and Bear in Riparian Forests of Alaska". Ecosystems. 9 (2): 167–180. doi:10.1007/s10021-004-0063-5. ^ a b Peek, J.; Beecham, J.; Garshelis, D.; Messier, F.; Miller, S. & Dale, S. (2003). "Management of Grizzly Bears in British Columbia: A Review by and Independent Scientific Panel" (PDF). Retrieved 28 October 2009. ^ a b Berger, J.; Stacey, P.; Bellis, L. & Johnson, M. (2001). "A Mammalian Predator-Prey Imbalance: Grizzly Bear and Wolf Extinction Affect Avian Neo-Tropical Migrants". Ecological Applications. 11 (4): 947–960. doi:10.2307/3061004. JSTOR 3061004. ^ "Grizzly Bear Eating Salmon". The Grizzly Bear Blog. Retrieved 21 July 2010. ^ Gunther, K.A. ; Biel, M.J.; Anderson, N.; Waits, L. (2002). "Probable Grizzly Bear Predation On An American Black Bear in Yellowstone National Park" (PDF). Ursus. 13: 372–374. JSTOR 3873219. ^ Yahner, Richard H. (27 April 2011). "Why are grizzly bears more aggressive than our black bears?". The Daily Collegian. State College, Pennsylvania: Collegian (Students at Pennsylvania State University). Archived from the original on 25 April 2012. Retrieved 16 October 2011. ^ How Dangerous are Black Bears. Bear.org. Retrieved 17 August 2012. ^ Ministry of Environment. 2002. Grizzly Bears in British Columbia. Retrieved 12 October 2009. ^ a b MacHutchon, A. Grant & Wellwood, Debbie W. (2002). "Reducing bear-human conflict through river recreation management". Ursus. 13: 357–360. JSTOR 3873216. ^ Wilkinson, Todd; 20, National Geographic PUBLISHED August. "What Do You Do With a Bear That Kills a Person?". National Geographic News. Retrieved 21 August 2015. ^ Austin, M. A., Wrenshall, C. (2004). An Analysis of Reported Grizzly Bear (Ursus arctos): Mortality Data for British Columbia from 1978 to 2003 (pdf). BC Ministry of Water, Land and Air Protection. Retrieved 27 October 2009. ^ a b c Ciarniello, L.; Davis, H. & Wellwood, D. (2002). ""Bear Smart" Community Program Background Report" (PDF). BC Ministry of Water, Land and Air Protection. Retrieved 30 October 2009. ^ Batin, Christopher (31 January 2006). "How to Outrun a Grizzly [and other really bad ideas]". Outdoor Life. ^ Herrero, S.; Higgins, A. (2000). "Human Injuries inflicted by bears in Alberta: 1960–98". Ursus. 14 (1): 44–54. JSTOR 3872956. ^ Facts: Casey & Brutus: Grizzly Encounters – National Geographic Channel – UK. Natgeotv.com (2010-04-20). Retrieved 29 August 2013. ^ "Species at Risk – Grizzly Bear Prairie population". Environment Canada. 8 May 2006. Retrieved 8 April 2008. ^ "Species Profile: Grizzly Bear Northwestern Population. In: Species at Risk Public Registry. 2009". Retrieved 11 November 2009. ^ "Grizzly Bear Recovery. In: US Fish and Wildlife Service. 2009". ^ Knibb, David (2008) Grizzly Wars: The Public Fight Over the Great Bear, Eastern Washington University Press, pp. 164–213, ISBN 978-1-59766-037-2. ^ Knibb, David (2008) Grizzly Wars: The Public Fight Over the Great Bear, Eastern Washington University Press, pp. 202–204, ISBN 978-1-59766-037-2. ^ "Public Meetings for the U.S. Fish and Wildlife Service's Proposal to Remove Yellowstone Area Population of Grizzly Bears from List of Threatened and Endangered Wildlife". U.S. Fish & Wildlife Service. 29 December 2005. ^ "Successful Recovery Efforts bring Yellowstone Grizzly Bears off the Endangered List" (PDF). U.S. Fish & Wildlife Service. ^ Barnett, Lindsay (22 September 2009). "Judge renews protected status for Yellowstone's grizzly bears". Los Angeles Times. ^ Huber, Djuro (January 2010). "Ursus arctos (Brown Bear, Grizzly Bear, Mexican Grizzly Bear)". The IUCN red list of endangered species. International Union for Conservation of Nature and Natural Resources. Retrieved 11 June 2010. ^ "Wildlife Status – Grizzly bear – Population size and trends". Fish and Wildlife Division of Alberta Sustainable Resource Development. Archived from the original on 26 December 2008. Retrieved 6 April 2008. ^ Alberta Grizzly Bear Recovery Team. "Alberta Grizzly Bear Recovery Plan 2008–2013, Alberta Species at Risk Recovery Plan No. 15" (PDF). Archived from the original (PDF) on 29 May 2008. Retrieved 6 April 2008. ^ Alberta designates grizzly bears a threatened species. Alberta.ca (2010-06-03). Retrieved 5 August 2013. ^ "Species at Risk – Grizzly Bear Northwestern population". Environment Canada. 8 May 2006. Retrieved 6 April 2008. ^ Hamilton, A.N. "Grizzly Bear Population Estimate for British Columbia. In: Ministry of Environment. 2008" (PDF). ^ Bear Specialist Group 1996. "Ursus arctos ssp. nelsoni. In: IUCN 2007. 2007 IUCN Red List of Threatened Species". Archived from the original on 8 March 2008. Retrieved 9 April 2008. ^ Brown, David Earl (1985). The grizzly in the Southwest : documentary of an extinction. ^ "Khutzeymateen Grizzly Bear Sanctuary". env.gov.bc.ca. ^ "Wildlife and Education: Refuge for Endangered Wildlife". Grouse Mountain: The Peak of Vancouver. 2009. Archived from the original on 6 February 2010. Retrieved 11 November 2009. ^ Krebs, C. J. (2009). Ecology: The Experimental Analysis of Distribution and Abundance (6th ed.). San Francisco: Benjamin Cummings. ISBN 978-0-321-50743-3. ^ Clevenger, A. P.; Waltho, N (2005). "Performance indices to identify attributes of highway crossing structures facilitating movement of large mammals". Biological Conservation. 121 (3): 453–464. doi:10.1016/j.biocon.2004.04.025. ^ Edwards, M. A.; Nagy, J. A.; Derocher, A. E. (2008). "Using Subpopulation structure for barren-ground grizzly bear management". Ursus. 19 (2): 91–104. doi:10.2192/1537-6176-19.2.91. ^ Michael, F.P. ; Bruce, N.M. & Curtis S. (2002). "Population Fragmentation of Grizzly Bears in Southeastern British Columbia, Canada" (PDF). Ursus. 8: 153–160. JSTOR 3873196. ^ "North Cascades Ecosystem Grizzly Bear Restoration Plan /Environmental Impact Statement". Conservation Northwest. National Park Service and US Fish and Wildlife. Retrieved 15 March 2015. ^ "Interagency Grizzly Bear Committee". Interagency Grizzly Bear Committee. Retrieved 15 March 2015. ^ a b c d "North Cascades Ecosystem Grizzly Bear Restoration Plan/Environmental Impact Statement". Conservation Northwest. Retrieved 15 March 2015. ^ a b Region, U.S. Fish and Wildlife Service: Mountain-Prairie. "Secretary Zinke Announces Recovery and Delisting of Yellowstone Grizzly Bear". www.fws.gov. Retrieved 6 July 2017. ^ "U.S. Proposes Lifting Protections for Yellowstone-area Grizzlies". 4 March 2016. ^ "Be a guest of Katmai's brown bears". CNN. Retrieved 27 June 2013. ^ "Brown Bears of Katmai". National Park Service. Retrieved 6 July 2013. ^ "Bear Watching in Katmai National Park and Preserve". National Park Service. Retrieved 6 July 2013. ^ "Katmai National Park and Preserve Webcams Make Katmai Bears Accessible to the Public". Sierra Sun Times. Archived from the original on 7 January 2014. Retrieved 30 July 2012. ^ "McNeil River — State Game Sanctuary and Refuge". Retrieved 12 March 2013. ^ "Friends of McNeil River Bears – About". Friends of McNeil River. Retrieved 4 July 2013. ^ "McNeil River — State Game Sanctuary and Refuge Permits". Alaska Department of Fish and Game. Retrieved 12 March 2013. ^ "Sport Hunting – Katmai National Park and Preserve". National Park Service. Retrieved 6 July 2013. ^ Fiorucci, Dan (17 July 2012). "10,000 Visitors Meet 2,500 Bears at Katmai National Park". articles.ktuu.com. Archived from the original on 10 May 2013. ^ "Bear Viewing on Admiralty Island near Juneau, Alaska | Juneau CVB". Travel Juneau. ^ "Stan Price — State Wildlife Sanctuary". Alaska Department of Fish and Game. ^ "Island Of The Big Grizzlies". Outdoor Channel. Retrieved 22 October 2012. ^ "Kodiak Brown Bear". U.S. Fish and Wildlife Service. Retrieved 7 April 2012. ^ "O'Malley River". Kodiak Brown Bear Center. Archived from the original on 5 August 2013. "Ursus arctos horribilis". Integrated Taxonomic Information System. Retrieved 18 March 2006. Cronin, M. A.; et al. (1991). "Interspecific and specific mitochondrial DNA variation in North American bears (Ursus)". Canadian Journal of Zoology. 69 (12): 2985–2992. doi:10.1139/z91-421. Herrero, Stephen (1985). Bear Attacks. Piscataway, NJ: New Centuries Publishers. ISBN 978-0-8329-0377-9. Waits, L. P.; et al. (1998). "Mitochondrial DNA phylogeography of the North American brown bear and implications for conservation". Conservation Biology. 12 (2): 408–417. doi:10.1046/j.1523-1739.1998.96351.x. Mattson, J.; Merrill, Troy (2001). "Extirpations of Grizzly Bears in the Contiguous United States, 1850–2000". Conservation Biology. 16 (4): 1123–1136. doi:10.1046/j.1523-1739.2002.00414.x. Wielgus, R. B. (2002). "Minimum viable population and reserve sizes for naturally regulated grizzly bears in British Columbia". Biological Conservation. 106 (3): 381–388. doi:10.1016/S0006-3207(01)00265-8. Groom, M. J.; Meffe, G. K.; Carroll, C. R. (2006). Principles of Conservation Biology (3rd ed.). Sunderland, MA: Sinauer Associates. Lapinski, Mike (2006). Grizzlies and Grizzled Old Men: A Tribute to Those Who Fought to Save the Great Bear. Guilford, CT/Helena, MT: Globe Pequot Press – Falcon Imprint. ISBN 978-0-7627-3653-9. Murie, Adolph (1985). The grizzlies of Mount McKinley. Seattle: University of Washington Press. ISBN 978-0-295-96204-7. McCory, W.P. ; Herrero, S.M. ; Jones, G.W. & Mallam, E.D. (1990). "A Selection of Papers from the Eighth International Conference on Bear Research and Management, Victoria, British Columbia, Canada. Bears: Their Biology and Management". 8: 11–16. Proctor, M.F. ; McLellan, B.N. ; Strobeck, C. & Barclay, R.M.R. (2005). "Genetic analysis reveals demographic fragmentation of grizzly bears yielding vulnerably small populations". Proc Biol Sci. 272 (1579): 2409–2416. doi:10.1098/rspb.2005.3246. PMC 1559960. PMID 16243699.